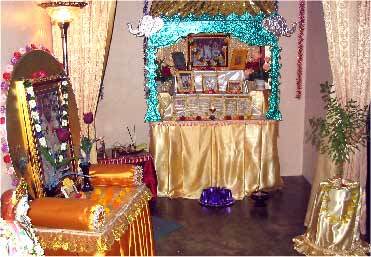 Srila Guru Maharaj's vyasasan and the main altar decorated nicely for this function. 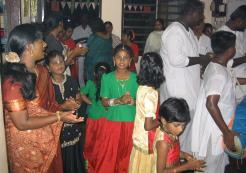 A lively kirttan was led by Prabhu Tribhuvanath. 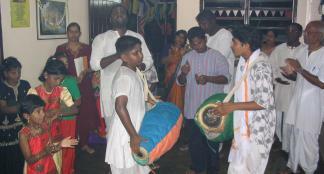 Tara Deva plays the mridanga with blue and orange cover, and Prabhu Rama Ratan plays the mridanga with a green cover. Aravind plays the karatals, and chanting enthusiastically are Prabhu Chaitanya Vigraha, Prabhu Gopendra Nandana and Prabhu Nityanath. 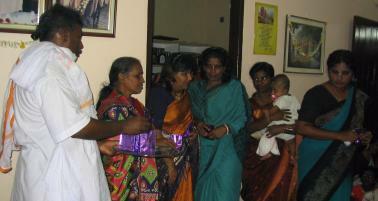 Auspicious gifts were given to all the married ladies. Helping are Prabhu Maha Vishnu, Letchmy Mataji, Indu Rehka Devi Dasi, Vasanthika Devi Dasi, Krishna Sangini Devi Dasi with Prabhu Hari Chandan and Gita Devi Dasi. 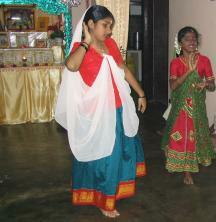 Kogilavani and Ruditya performing a dance about the Pastimes of Sri Sri Radha-Krishna. 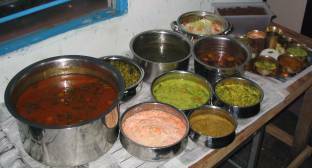 Finally, after class and arati, Maha-Prasadam was served buffet style for everyone's satisfaction.